When your family gets together for Thanksgiving dinner, do you have a "no politics at the dinner table" ban? Most do, and for obvious reasons. In today's hyper-partisan political climate, worsened as so many things are by the election of Donald Trump, too many families and friendships have been irreparably torn apart. Let's face it, family gatherings are already a powder keg of secrets, tensions, and petty grievances, but you throw Uncle Bob's racist chain emails into the discussion and who knows what might pop off. With his directorial debut The Oath, Ike Barinholtz takes a look at this grim state of affairs and chooses to take it on with a dark but undeniably hilarious sense of humor, which he uses to teach a valuable holiday lesson. While I laughed a lot at The Oath, it was also one of the scariest movies I've seen in months. Not because of the twisted, violent route it eventually takes but because I identified a little too much with Chris (Barinholtz), a left-leaning political junkie whose every waking moment is consumed by news of the moment. He has reason to be concerned, as the President has passed a Loyalty Oath, a pledge of solidarity with the current administration that comes with certain social and financial benefits to those who sign. 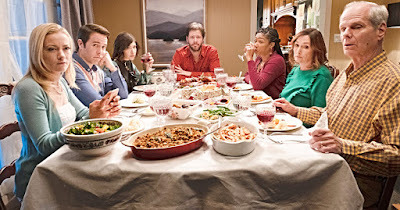 Chris and his equally progressive wife Kai (Tiffany Haddish) are vehemently opposed to signing, even as the friends, co-workers, and family around them are caving. There aren't any overt threats made against those who don't sign, but clearly a distinction is being made by those in power, and protesters are being met aggressively. It sounds like the origin to the origin of The Purge or something, and not like the start of a wild political satire from a cast full of talented comedians. The deadline to sign landing on Black Friday, Chris and Kai's home becomes ground zero for a verbal war over the Oath, despite their own pledge to be apolitical for just one evening. Lighting up this bad boy are Chris' conservative brother Pat (Jon Barinholtz), and Tomi Lahren-esque girlfriend Abbie (Meredith Hagner), while their parents (Nora Dunn and Chris Ellis) try to stay out of the sibling squabble. Then there's Alice (Carrie Brownstein), Chris and Pat's progressive sister, who is basically that one family member who tries to keep everyone happy, putting her own beliefs aside to keep the peace. However, when a pair of government agents (John Cho and Billy Magnussen) show up making subtle threats encouraging Chris to sign, everybody goes off the rails. Barinholtz's politics shine through in his depiction of Chris, but he actually does a great job of staying fair and balanced (intended) to both sides of the ideological spectrum. His film is about the danger of political extremism in all of its forms, Chris often finds his stated beliefs challenged in unexpected ways by those he thinks support him most. We're invited to laugh at his many hypocrisies and holier than thou rhetoric, often aimed at his brother who is the classic ignorant, ultra-patriotic Fox News watcher. Flip on talk radio and you can hear a version of their rantings any time of day, but it's a breath of fresh air to hear them and not take them so seriously. The balance gets thrown out of wack as the violence escalates, with the second half of The Oath barely resembling anything from earlier on. It's a safe bet that some will relate more to the family comedy aspects more than the Twilight Zone stuff it steers into later, although the commentary remains sharp throughout.While there are terrific individual performances, most notably from Haddish who adds a maternal element to her usual sass, the strength is in the ensemble. I don't know if Barinholtz encouraged improvisation but it sure feels like it, and with this cast he'd have been crazy not to. No matter how far over the edge Barinholtz pushes things, and they go pretty damn far, he does it as a reminder of what's truly important. No matter how ugly the discourse may get, family must always come first. Even when a tyrannical government comes knocking on the door, protecting those you love is all that really matters. No matter who you voted for, The Oath offers a little something to smile about during these heated political times.